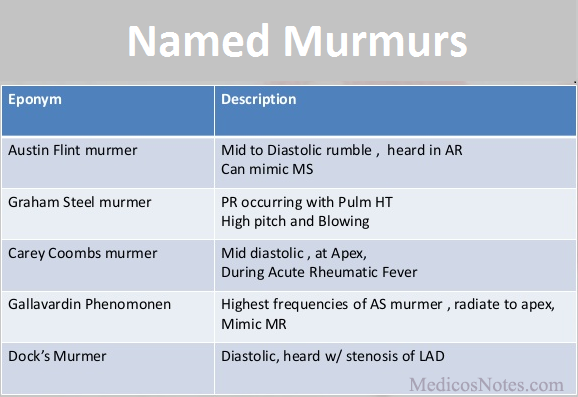 What are the named murmurs in cardiology? Following are the named murmurs. It is the innocent musical murmur ,seen in children. Mid diastolic murmur heard in apex in patients with aortic regurgitation. It is the loud pansystolic murmur which is heard maximally at the left sternal border. Heard in Ventricular septal defect (VSD). Early diastolic murmur which is heard over Erb's point.Heard in pulmonic insufficiency, secondary to pulmonary hypertension and mitral stenosis. Mid diastolic murmur, heard in acute rheumatic valvulitis. Occur in complete heart block, this is a mid diastolic murmur. This is a diastolic murmur, occur in left anterior descending (LAD) artery stenosis. Heard due to air in right ventricular cavity following cardiac catheterization. Diastolic murmur heard best at the left sternal border. heard in anemic patients .The murmur resolves with treatment of anemia. Continuous murmur heard in patent ductus arteriosis.Best heard at the left upper sternal border. The Key–Hodgkin murmur is a diastolic murmur of aortic regurgitation .Hodgkin correlated this diastolic murmur with retroversion of the aortic valve leaflets ,seen in syphilitic aortic regurgitation.